Star Realms has been out for a while and has an excellent user base and online matchmaking. It is a classic “easy to learn, difficult to master” game. check out our review here. In this guide we will break down some of the different strategies in play to help you rise up the leader board. For the first installment, we will take a look at some of the very basics as well as a closer look at what the factions have to offer. Above all else in this game, you have to play what the game gives you. If you are stubborn in waiting for specific cards or hands to come out, your opponent will chug along and easily take you out. You have to be ready to adapt when the situation calls for it even if it means breaking the advice given below. This is really the crux of most of the early decision making in this game. Do you go all out for Trade value to try to get the better cards quicker, or do you just start blasting away at your opponent from the get go and hope to beat them in the race to destroy each other. The best answer is, of course, somewhere in the middle, but that's a cop out to leave it there. More often than not, going for Trade early over Combat will pay off. You will rarely see somebody going 100% combat who can actually overcome the better cards their opponent is able to buy later in the game. It's not entirely fair to say Trade and Combat are always 100% equal (in fact, they are very much NOT equal depending on the current game situation), but in this case you get 8 combined with the two Machine Cult cards versus 5 combined with the two Trade cards. There will be other factors in play every time, such as if there's a game changing card out there you want to try to buy early or if there are two higher priced Blobs, you will have to weigh those all with each game, but the point is, you will usually get more bang for your buck playing to combine faction cards. So combining faction cards is good, but how many factions should you collect? As a rule of thumb I generally try to stick to two primary factions early in the game. Like most everything here, this isn't set in stone, but generally if I'm trying to buy up three or all four factions, I'm heading for a loss. Pick your targets early and focus on them throughout. It's pretty basic but often overlooked by new players: If you dump all of the bad cards from your deck, you are guaranteed to draw five good cards every turn. That's the extreme case, it's practically difficult to actually dump all ten of your starting cards, but that is the goal you start buying Machine Cult cards (and it certainly does happen occasionally). 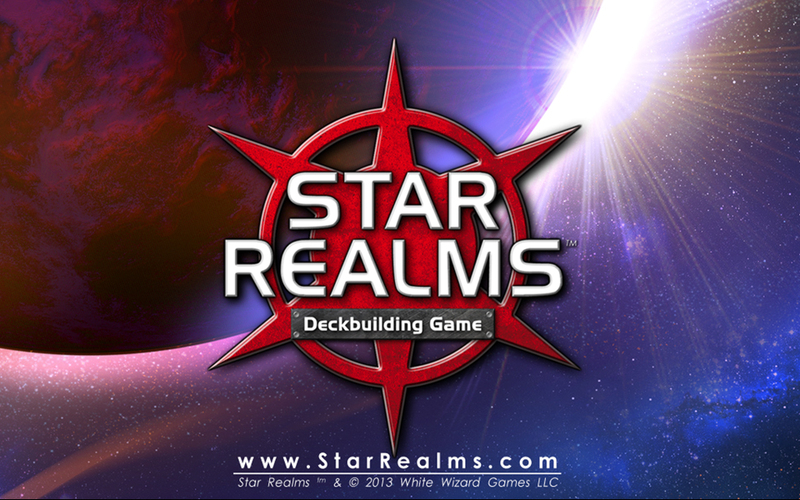 There are four factions in Star Realms, with almost every card belonging to one or being able to be assigned to one when played: Trade Federation, Star Empire, Machine Cult, & The Blobs. Each faction has at least one unique ability. The basic strategy offered by each differs and can often be accurately described by looking at the cheapest cards each has to offer. Let's take a quick look at each. Federation is the faction which gains back your Authority. Cheaper Federation cards are heavy on Trade and Authority. As the cards get stronger they gain Combat and card draw abilities. Federation cards also have the unique ability to all you to place a newly acquired ship on the top of your draw pile instead of discard pile. This paired with a draw card in your hand can lead to you take a card from Trade Row and getting it into play in one turn, potentially a very powerful move. Star Empire has the unique ability to force discards by your opponent. There is a very satisfying moment to be had by forcing a full 5 card discard by your opponent. Star Empire cards, top to bottom, are heavy on Combat and card draws, with very few options for earning Trade. Machine Cult has the ability to scrap cards from your hand or discard pile. If you are able to completely purge your deck of bad cards you are likely headed for a victory, the trick is doing do before your opponent can defeat you. Machine Cult is actually the most balanced faction, having multiple primarily Trade and Combat cards, and one which allows you to choose between the two. The more expensive Machine Cult ships are all Combat based and earn the ability to draw cards with their faction ability. Blob is the widest ranging faction and have unique abilities in being able to scrap Trade Row cards, instantly destroy opposing bases and automatically acquire a ship from Trade Row without paying its cost. Blobs are mostly Combat focused but have one of the most powerful cheap Trade cards, the Trade Pod mentioned earlier. Blob cards have a heavy emphasis on extra card draws. Thanks for reading. Next time through we will take a look at how the various factions interact with each other, and the benefits/downside of Outposts and Bases.